Our O-Ring Analyst software generates “standard” static O-Ring gland dimensions, and presents them in an editable format so the user can optimize them for function, manufacturability, ease of assembly, etc. Compression results take into account cross-sectional reduction due to installation stretch. Compression and extrusion gap results are given for nominal and worst case sizes, and for concentric and eccentric conditions. Nominal running friction is also estimated. Our Helical Spring software is used to design round wire helical compression springs. The software consists of two modules. The “Auto Generator” module generates a series of spring geometries covering an index of 4 to 16 that are based on a user-defined solid load and stress. 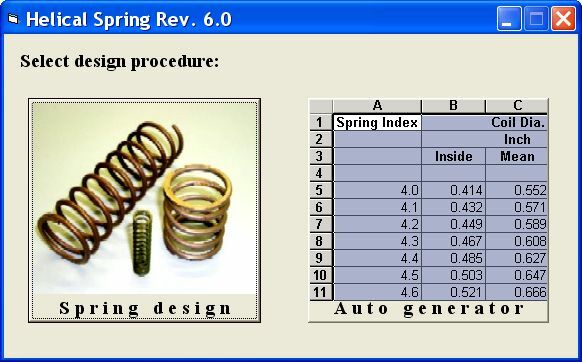 The user can then refine the most appropriate diameter spring using the “Spring Design” module, which presents results in an editable format. 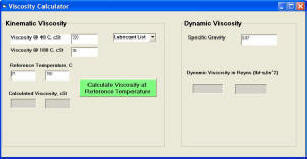 Our Viscosity-Calculator software is used to predict the kinematic viscosity of an ISO lubricant at specified temperatures. The viscosity predictions are based on Walther’s equation, which is the basis for ASTM D341 charts. USE THE LITERATURE ENTIRELY AT YOUR OWN RISK. THE LITERATURE IS PROVIDED “AS IS”, “WITH ALL FAULTS”. KALSI ENGINEERING MAKES NO WARRANTY, EXPRESS, OR IMPLIED REGARDING THE LITERATURE, INCLUDING BUT NOT LIMITED TO WARRANTIES OF MERCHANTABILITY, PERFORMANCE, AND FITNESS FOR A PARTICULAR USE OR PURPOSE. KALSI ENGINEERING (INCLUDING ITS AGENTS AND EMPLOYEES) ASSUMES NO LIABILITY WHATSOEVER FOR ANY LOSS OR DAMAGE OF ANY KIND OR NATURE THAT MAY RESULT FROM THE USE OF, REFERENCE TO OR RELIANCE ON THE LITERATURE, INCLUDING BUT NOT LIMITED TO CONSEQUENTIAL, SPECIAL (INCLUDING LOSS OF PROFIT), DIRECT, INDIRECT, INCIDENTAL OR SIMILAR DAMAGES, EVEN IF KALSI ENGINEERING HAS BEEN ADVISED OF THE POSSIBILITY OF SUCH DAMAGES.